All the useful information that you need to know before sending money with Xoom! Launched in the year 2001, Xoom offers fund transfer services from the US and Canada to more than 130 countries. Powered by PayPal, Xoom can help people to pay bills internationally or send money to friends and family. It is a leading service provider that makes sending money across Europe, South America, Central America and Asia easy and hassle-free. One can send the money through a bank account, debit card or credit card and the recipient will get the money within a few minutes. It also offers the cash pick-up facilities across the world, so recipients will get the money as soon as payment made by the user. Customers can also use Xoom to pay electricity, telephone, gas, and more bills in selected foreign countries. One can send a maximum amount up to USD $10,000 through a single transaction. It also offers 24-hours, 30 days and 180 days limits according to the Xoom account’s level. One can increase the level by providing more personal details such as government provided identification, proof of income and proof of residence. Recipient countries, as well as partners, also have a bearing limit. Xoom customer services are available 24*7 on its toll-free number. It has been working more to provide hassle-free transaction as well as high security so that one can use Xoom money transfer services worry-free. Pricing : How much does Xoom cost? One can also check the Xoom transfer fee here. The company offers rates above the mid-market exchange rate, as it makes money from the transfer fee charged by the users. The company claims that credit card transfers may attract more fees because of providing advance money. So one should know from the credit card company if they charge any such fee or not. So, on the pricing basis, Exchange Rate IQ gives 7 out of 10 to Xoom as many companies even offer real-time prices with low transfer fee. Transparency: Does Xoom have any hidden fees? The company makes money while doing a foreign exchange, so there are chances of hidden fee. So before transferring the funds with Xoom Corporation, one should know how much fee it will be going to take. The company provides tracking details to customers at every stage through SMS and email. One can also track the transfers on their dashboards by logging in. While many of the companies do not charge any hidden fee, Xoom charges it to make money, therefore we rate it 7 out of 10 in the transparency head. 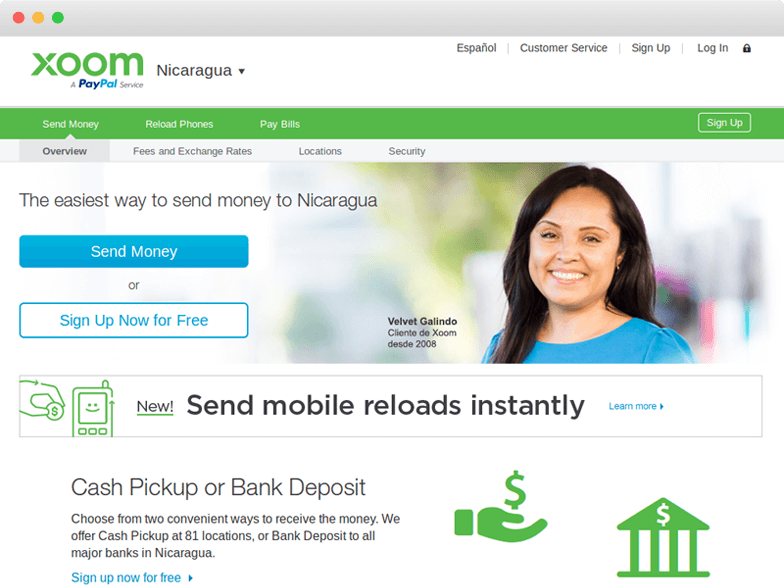 Transfer Speed: How long does it take to send money through Xoom? Xoom money transfer service offers faster turnaround compare to many banks. In many cases, the recipient will get the access to money transferred within minutes. However, this process time also depends on the mode of payment, destination country and transfer method. Sometimes, it takes more time to transfer funds as recipient bank requires additional information. The company also takes more time on the public holidays, bank specific working hours as well as wrong recipient details. Once you finalise your transfer, Xoom will provide you the clear picture of how long the process will take. Therefore, on an overall basis, we rate 9 out of 10 to the transfer speed of Xoom. Security : Is Xoom Safe? Protection is the foremost priority of Xoom. With more than 1 million clients, Xoom has a proven track record when it comes to keeping your info secure. Its parent company, PayPal, is a public traded company. It provides high transparency by giving tracking details to users through mail and SMS. Xoom received an A+ rating from the Better Business Bureau and is certified by TRUSTe, which ensures it is highly rated. So, on the security basis, we rate Xoom 10 out of 10, as it is taking enough measures to keep people and their details secure. Xoom is highly user-oriented website. It provides the exchange rate as soon as you select the country where you want to send funds. It is also providing FAQs under help section to provide the user convenience answers. It is also providing exchange fee calculator, where you can select the country and mode of payment to know how much amount will be received by the recipient. One can contact the company at its toll free number 24*7 and also send them mail. One can directly send the mail to company from their website. You can also send the mail from here. One can also earn Amazon egifts by referring the services of Xoom Money Transfer to their friends. The company will provide a unique link which you can send to your friends. When they complete their first transaction, you will get Amazon egift card of value USD20. So keeping all the factors in mind, on an overall user experience basis, Exchange Rate IQ experts rate Xoom 8 out of 10. Coverage: How many Countries & Currencies does Xoom support? The company has yet to cover many parts of Asia, Africa and Europe which will make it one of top money remittance service provider in the world. As we can see, one can only transfer USD and CAD to other countries in their currencies, so company still has vast opportunity to grow to provide its services worldwide. Hence, on its coverage area, we rate it 8 out of 10. So, if you also want to use the services of Xoom money transfer login here. I sent money to Haiti and was successful on the first attempt. Exceeded my expectations with regard to ease of use. Quite happy with the service. I’ve been sending money to the Philippines Thru Xoom for many years, I just wish their exchange rate is a bit higher. my experiences with Xoom has been great!!! Im very happy with the xoom service. Its so easy that I actually enjoy sending money to my family and friends in my country. Best company to send money with. Go to the Xoom, a PayPal Service website. Select the country to which you want to send the funds at “Select a Country”. Select the payout method, i.e., bank account or cash pick-up. Select the mode of payment, bank account, debit card or credit card. Sign up if you are a new user. Enter all the personal details and an official government ID. Enter the details of recipient. Click on “Continue to Review”. Review all the transfer details and click on “Send”.